Popular Rivers Area in South East Ipswich. Three bedroomed double bay fronted semi-detached family home. Beautifully presented throughout. Ground floor cloakroom & first floor family bathroom. Open plan kitchen/diner plus separate lounge. Solar panels. Driveway and converted garage to the rear. The property is situated to the south east side of Ipswich offering good access out to the A14 commuter trunk road. The county town of Ipswich offers a wide range of local amenities including schools, University, shops, doctors, dental surgeries, hospital, two theatres, parks, recreational facilities and mainline railway station providing direct links to London Liverpool Street Station. The town has also undergone an extensive rebuilding and a gentrification programme principally around the vibrant waterfront which now boasts some lovely bars and restaurants. Double glazed obscure door to the front, obscure double glazed window to the side, laminate flooring and door to the hallway. WC, obscure double glazed window to the rear, lino flooring and cupboards. Double glazed bay fronted windows, radiator, laminate flooring, built in shelving in the fire place and two built in cupboards. Double glazed window to the rear, double glazed patio doors to the conservatory, radiator and entrance to the kitchen. Fitted kitchen with wall and base cupboards and units, sink and drainer, built in oven, plumbing for washing machine and dish washer, double space for fridge / freezer, cupboard housing boiler, work surfaces, cooker hood, tiled splashback and lino flooring. Construction UPVC, double glazed window to the rear, lights, tiled flooring and double glazed french doors to the rear. Double glazed bay window to the front, sliding wardrobes and radiator. Double glazed window to the front, built in wardrobes, radiator, spotlights and laminate flooring. 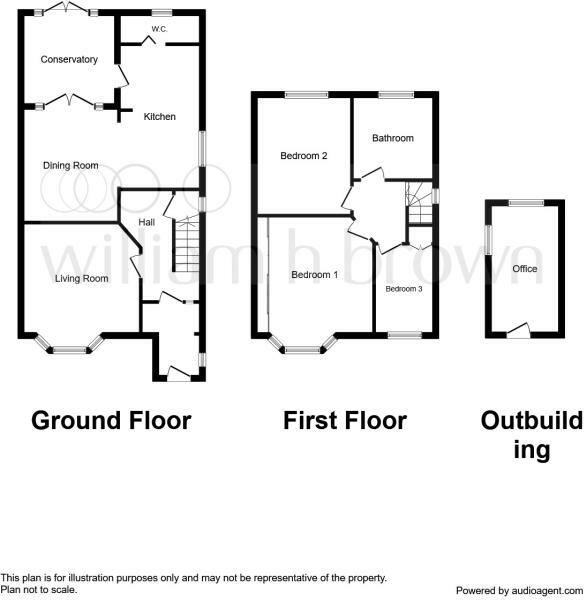 Contemporary four piece bathroom suite, obscure double glazed window to the rear, heated towel rail, stand-alone bath with hot and cold taps, shower cubicle, tiled walls, extractor fans, WC, laminate flooring and loft hatch. South-facing rear garden with raised decking area. Storage underneath. Shrub and flower bed border, lawn, shed and not overlooked. Converted garage to office, spotlights, double glazed window to the side / rear. Laminate flooring. Disclaimer - Property reference IPS113623. The information displayed about this property comprises a property advertisement. Rightmove.co.uk makes no warranty as to the accuracy or completeness of the advertisement or any linked or associated information, and Rightmove has no control over the content. This property advertisement does not constitute property particulars. The information is provided and maintained by William H. Brown, Ipswich. Please contact the selling agent or developer directly to obtain any information which may be available under the terms of The Energy Performance of Buildings (Certificates and Inspections) (England and Wales) Regulations 2007 or the Home Report if in relation to a residential property in Scotland.